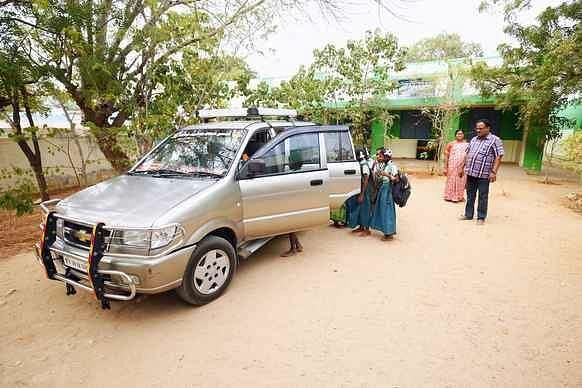 A government school Head Master in Karur have been winning hearts for years, for his moving gesture of picking and dropping his school students using own car. Not many days ago, many were angry with government school teachers for skipping the school and protesting for their cause. Though the JACTO GEO protest came to a halt, many criticised the teachers for not being responsible and caring about the education of the students. But Anbuselvan (48) has been winning hearts of the people of Chinna Sengal in Karur for years. Anbuselvan is working as the Head Master of Chinna Sengal Panchayat Union Primary School of Krishnarayapuram union in Karur. He has been picking up the students from their homes in the morning on his way to school and dropping them back in the evening. His move has brought a change in the mindset of the villagers, to make them quit sending their children to private schools and join them at the government school. Speaking about his initiative, Anbuselvan said, "I joined this school in 2012, as the Headmaster. During that time the strength was only 58 students. We were on the verge of losing out a teacher from our school as certain norms in government schools require a minimum of 61 students, keeping the students to teachers ratio in mind. Many parents from our region were sending their children to private schools, mainly because of the lack of bus facilities in our village." "Students come from Melathottam, Kuttikaranputhur and other nearby villages in the surrounding areas of Sengal. But as they don't have a bus to catch and come to school, many went to private schools. So I decided to do something. I started using my old car as a cab to bring children to school from remote areas. The move got a big hit and the parents started sending their children to our school," he said. "As my move started gaining recognition, the students' numbers also started increasing. So I ditched my old car and bought a bigger one, suitable for tarrying more students. Now, around 120 students are studying in our school, as a result of arranging transport facilities. And instead of losing out a teacher, we got an additional one, thanks to the increase in the numbers. Among the 120, I help over 70 students by picking and dropping them up in my car. And for this, I spend more than Rs 3,000 per week for the fuel expenses from my pocket. Well, things like transport we can take care by ourselves. But proper water supply to our school is beyond our control, which we look forward for a solution from the government," he concluded. The villagers are of huge praise for the HM's initiative of trying to bring in as many students as possible to the school and provide them education.